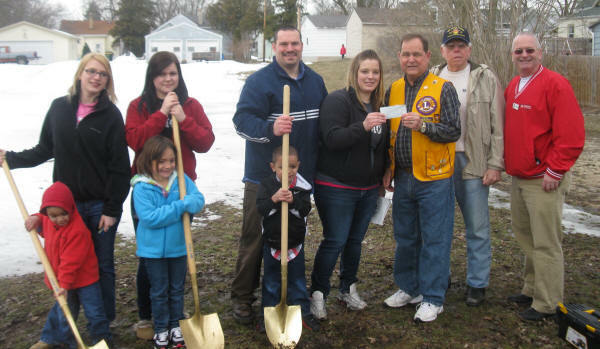 March 2013-- Members of the Fond du Lac Evening Lions presented a check for $600 to the Habitat for Humanity of Fond du Lac County at Habitat’s Hickory Street ground breaking. Pictured left to right are several family members, Aaron Goldstein, Board of Directors President, Brittany Steinke, the owner of the new house being built, Tom Clausen and Ed Barnes, Fond du Lac Evening Lions Club members and Paul Osterholm, Executive Director of Habitat for Humanity. The Fond du Lac Evening Lions club gives regularly to the Habitat for Humanity. Habitat for Humanity and Lions Clubs International have a joint relationship to provide homes for people with special needs.